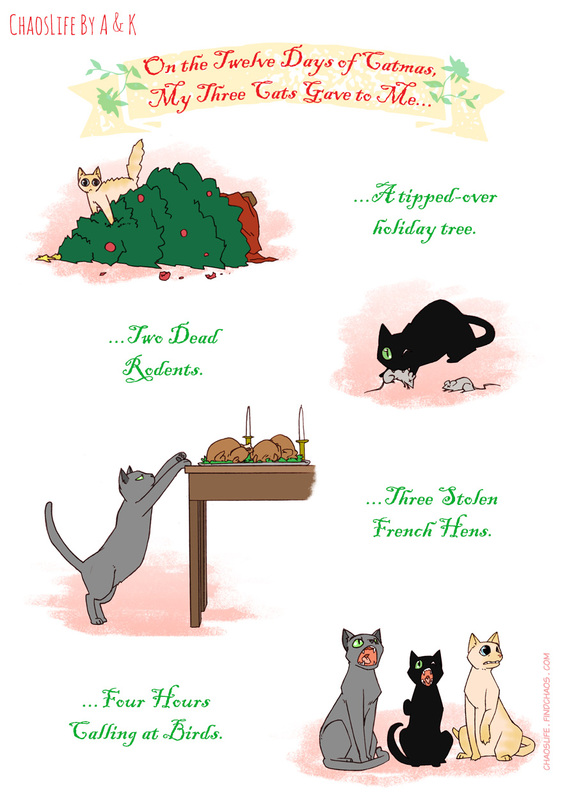 "12 Days Of Catmas Part 1"
so is this going to be a three part strip? because i can’t wait lol. also i’m surprised my cats haven’t knocked down my tree yet. Love it! Seven rescued kitties and a rescued dog here, and I can totally relate. Small point but isnt the strip in the wrong order? You know going from 1 to 4 instead of 4 to 1 like the song? Historically, the song has been transcribed in an ascending fashion. After all, it would be hard to repeat your way back through the verses if you didn’t know what had come first. Managed to keep my family’s old mog nicely happy and asleep (and out of the way, more importantly…) by grabbing a sock and running down to the botanic garden in the morning to find where they had some catnip growing…..
Just a note, parts one and two don’t link forward to two and three respectively.